← First Time Playing Bubble Soccer at AT Bubble Soccer! 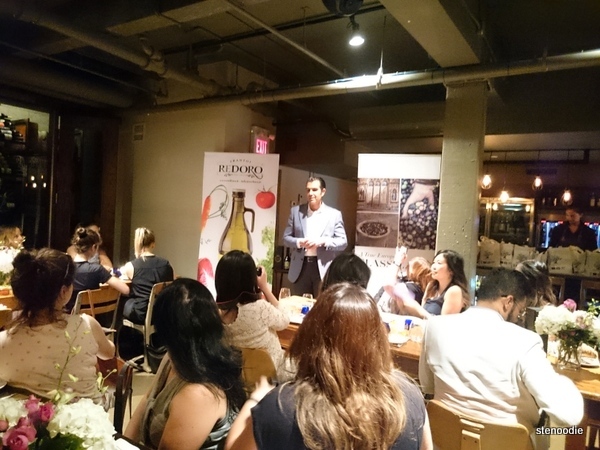 I had the pleasure of attending an Extra Virgin Olive Oil (EVOO) Event Series last night featuring a world renowned olive oil expert, Angelo Tramonti, with fellow food bloggers and influencers in Toronto. 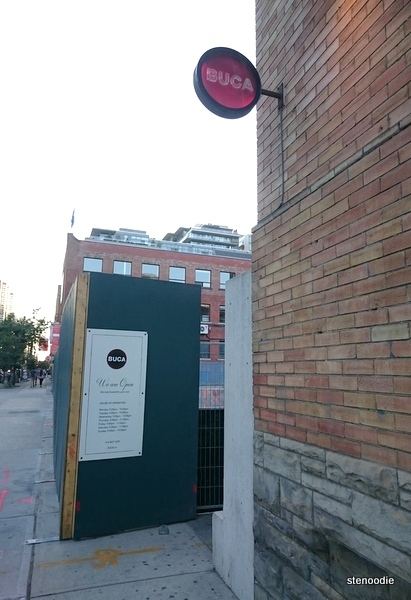 We were allowed to bring a guest with us and the event was slated to run from 6 to 9 p.m. on a Tuesday at the restaurant Buca on King Street West. 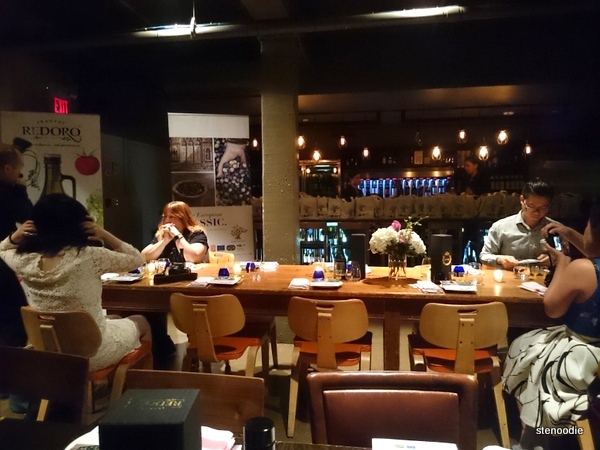 When I arrived at Buca just before the 6 o’clock mark, I was led graciously down the stairs by the staff to the left of the main area in the restaurant where there was a dimly lit private dining room all set up for the event. 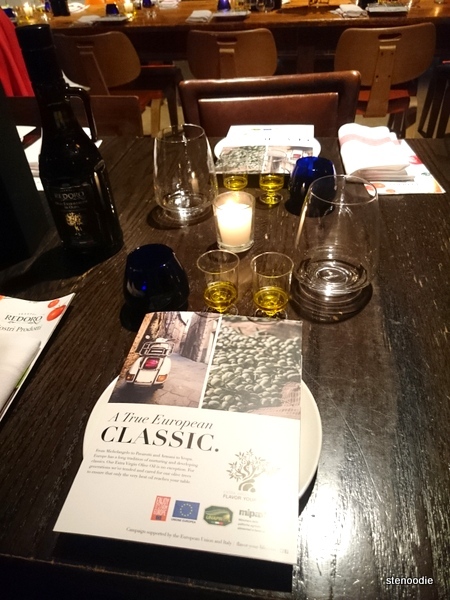 Each table was set up with some glassware, bottles of the Redoro olive oil, samples of olive oil, and the usual cutlery. 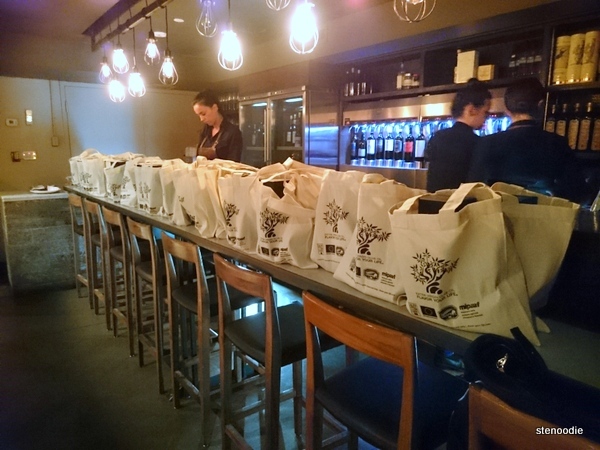 Near the bar area, there was a table set up with the gift bags that we were going to receive. 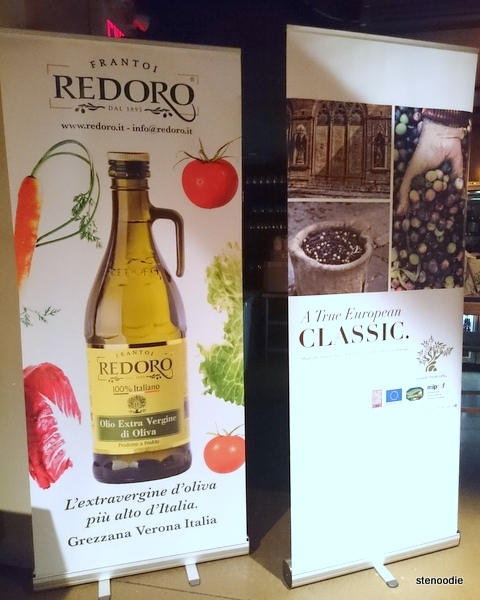 Some bottles of the Redoro olive oil were also set up next to the large posters. 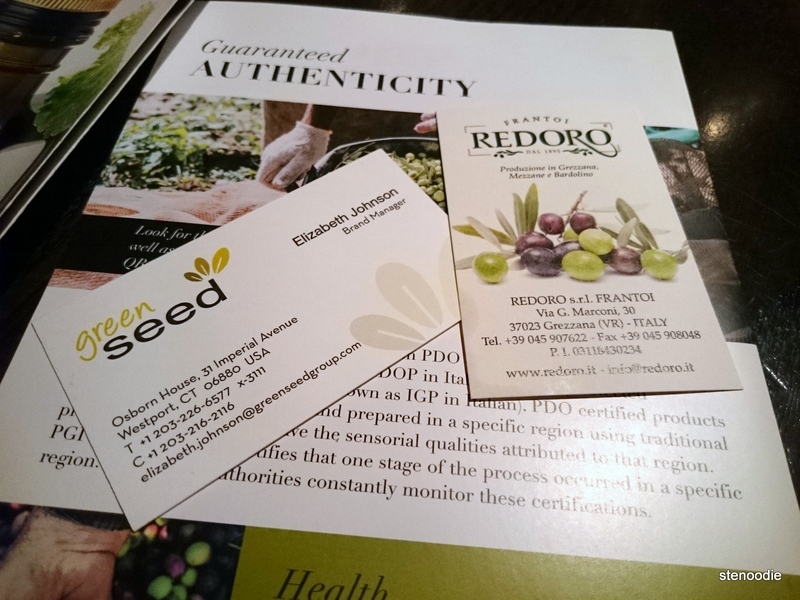 As I mixed and mingled with fellow food bloggers, the event didn’t actually begin until 6:30 p.m. Everyone took their seats and we were introduced to Elizabeth Johnson who was the Brand Manager for the Green Seed Group and part of Flavor Your Life who was running the event. 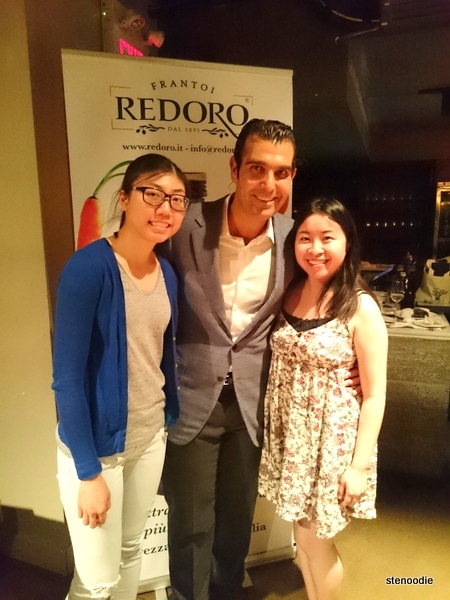 After that, she passed on the rest of the time to Angelo Tramonti, the main star of the event — the world renowned olive oil expert — who spoke to us about the Redoro extra virgin olive oil history, brand, and everything that we needed to know about extra virgin olive oil in general. 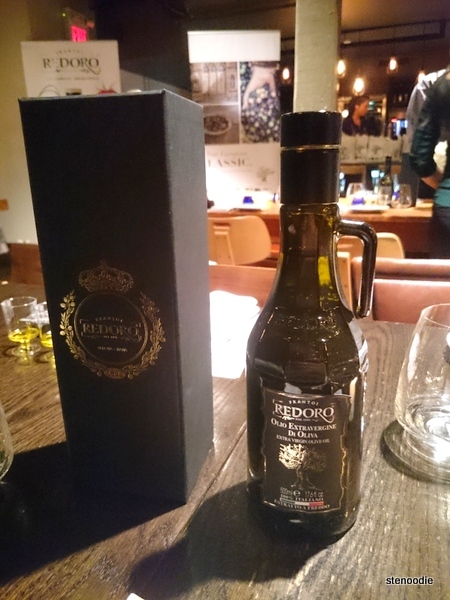 Redoro Extra Virgin Olive Oil. So fancy! 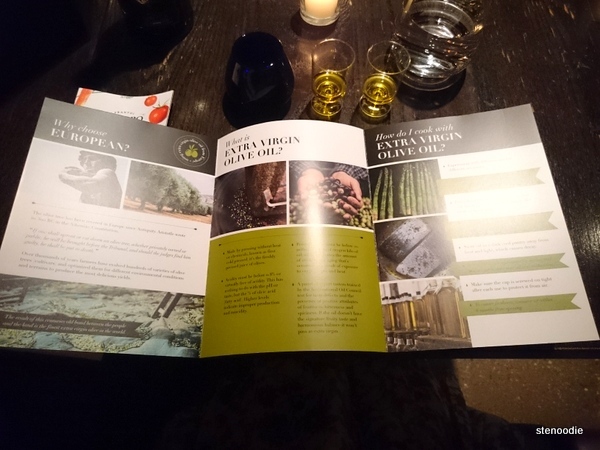 It was a very educational session and I learned many things and fun facts about extra virgin olive oil that I never knew about before: I learned that extra virgin olive oil is made by pressing without heat or chemicals, a process known as “first cold pressed”, which is the freshly pressed juice of olives. Extra virgin olive oil contains polyphenols, vitamin E, and many other natural antioxidants that are the oil’s own natural preservative. It is good in good fats which helps to lower bad cholesterol and increases good cholesterol. I learned about why extra virgin olive oil is used solely for salads, breads, or on top of fish but never cooked above a certain temperature otherwise it will ruin the process in which the olive oil was derived from the olives. I learned that more and more people are using olive oil in their everyday diets than ever before due to its many health benefits. The stats of olive oil usage grew in almost every country in the world, especially in Japan, where there was a 400% increase of olive oil use! 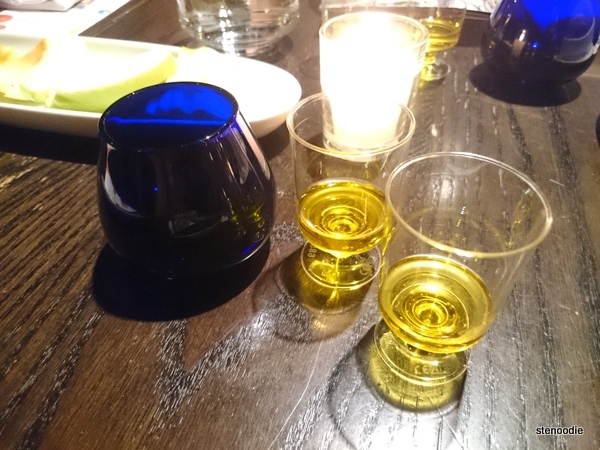 There were three samples of the extra virgin olive oil on our tables — two in small clear glasses and one in a blue dome-shaped glass. 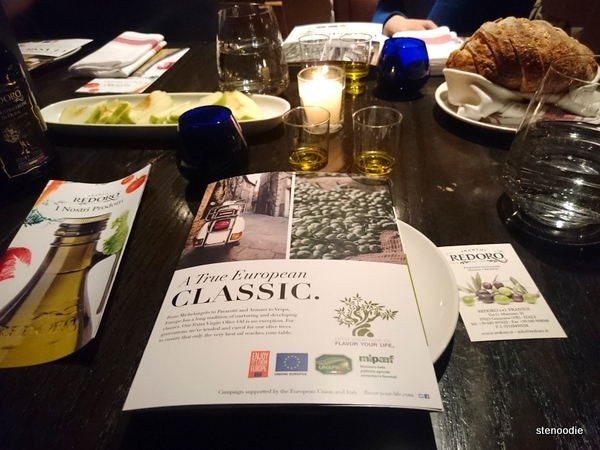 Angelo taught us how to “slurp” the olive oil to really get to know the taste of the olive oil but I think most of us in the room were too shy to slurp out loud haha. It was definitely an interesting experience. 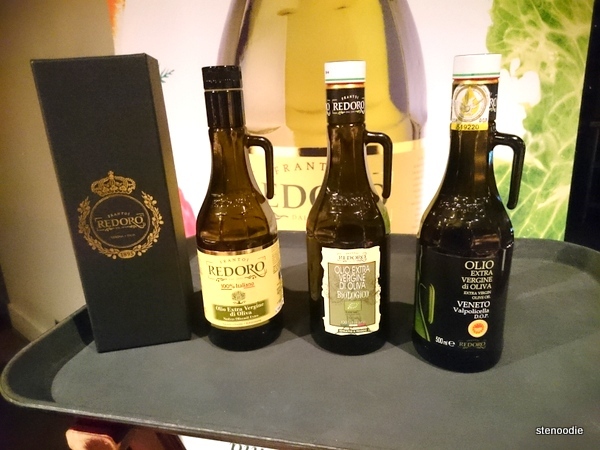 The extra virgin olive oil definitely was rich and high quality in taste. 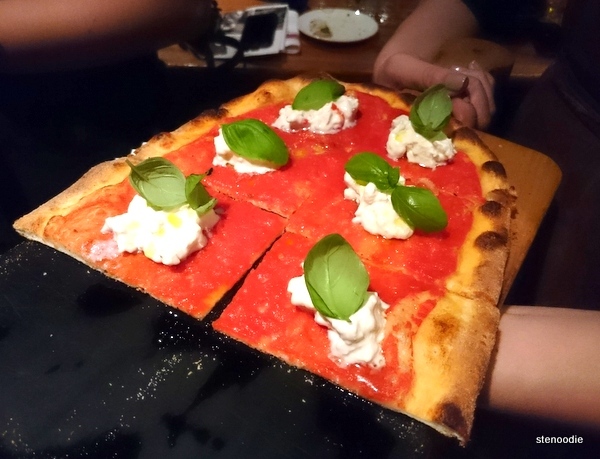 As a sipped on the EVOO, I could feel its smoothness run down my throat and there was a slight heat too. 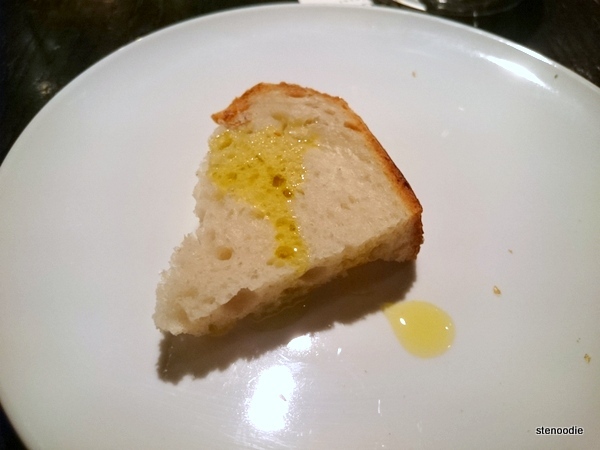 We were served a basket of bread and some sliced green apples to go with the olive oil tasting. 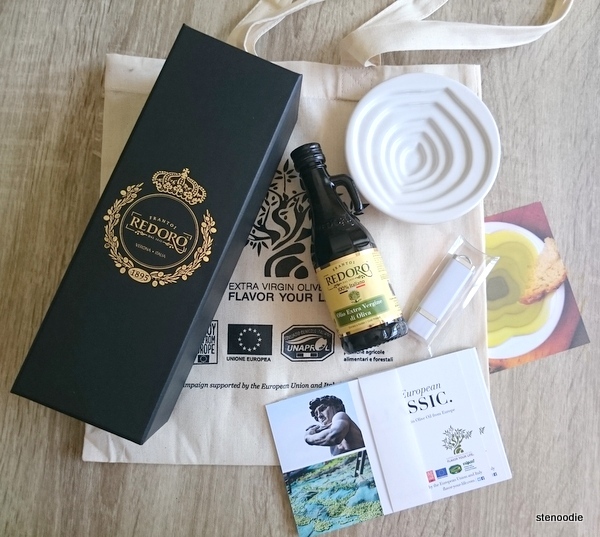 After learning all about the Redoro extra virgin olive oil and the olive oil tasting, it was then time for us to try the specially made hors d’oeuvres of the event! I was very excited for the actual food haha. I think most people were too since it was dinner time and we all were hungry. 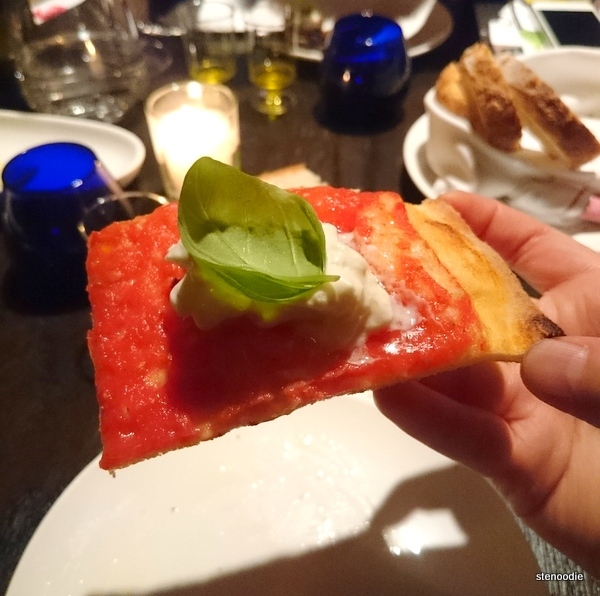 The servers at Buca each brought out different platters of the hors d’oeuvres. There were a lot of them and each one contained elements of the extra virgin olive oil in the making of the finger foods. First, we were served Stuzzchini, a Gorgonzola and apple moutarda Ricotta di buffalo and melanzane (it had eggplant in it) and it was really good! 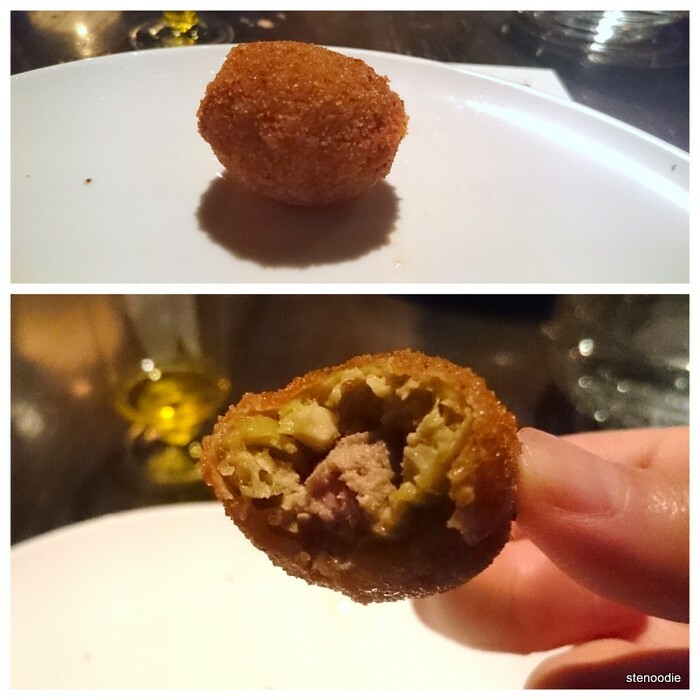 The Olive Ascolanes were fried olives stuffed with sausage. It came out of the kitchen piping hot so we needed to be careful when eating it. 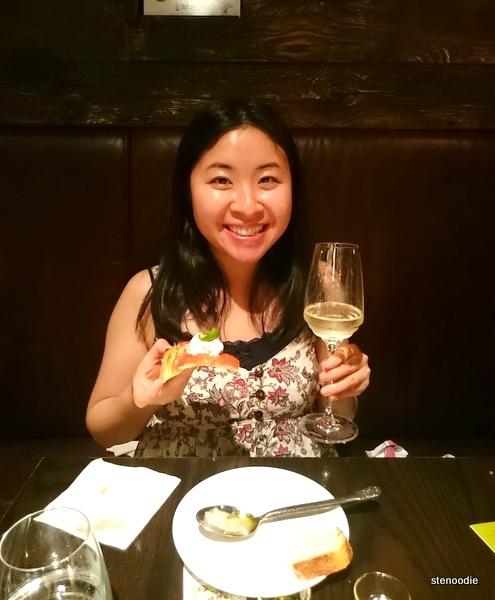 It was also really good — actually, everything we ate that night was delicious! 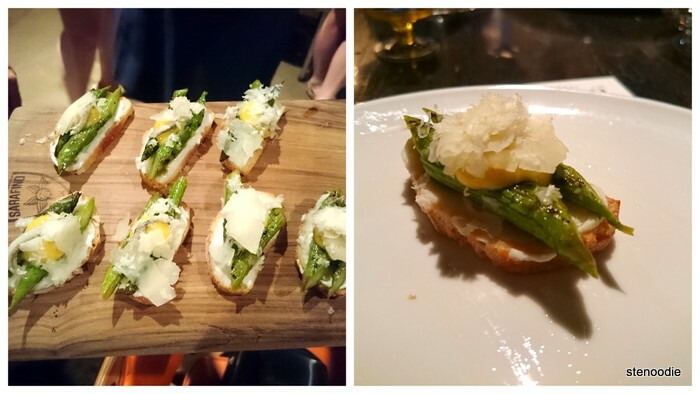 I didn’t get the name of this appetizer, but this crostini had cheese and asparagus on it. The cheese on this smelled amazing! 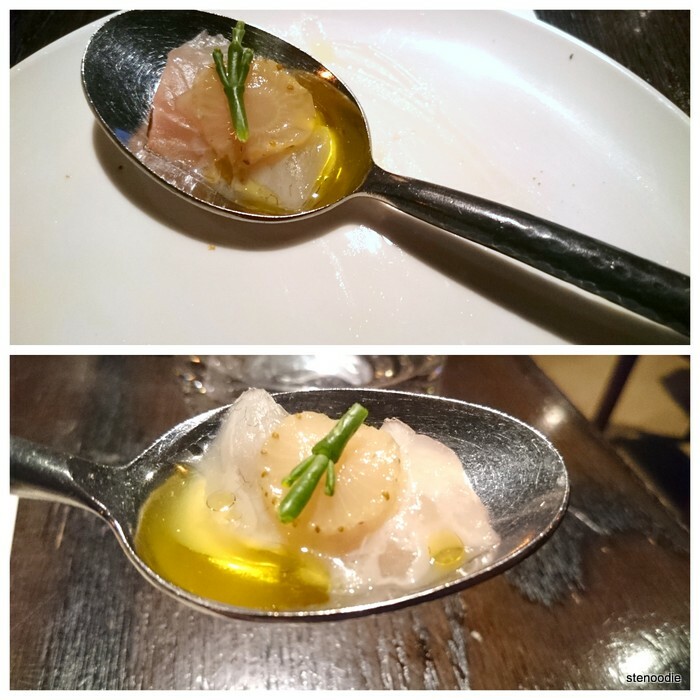 The Orata was raw sea bream from Cyprus, cedro lemon, sea asparagus, rosemary, with olive oil that was served on spoons. It was a beautiful presentation and I really enjoyed this one! The sea bream was so fresh and the olive oil paired so well with it. 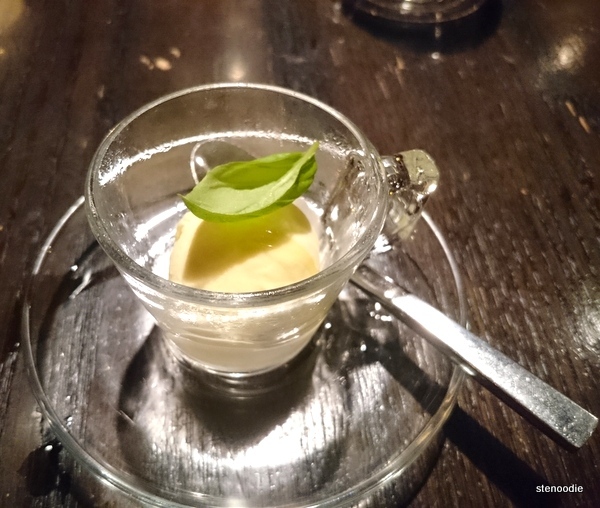 I must have had at least three of these raw sea bream spoonfuls! 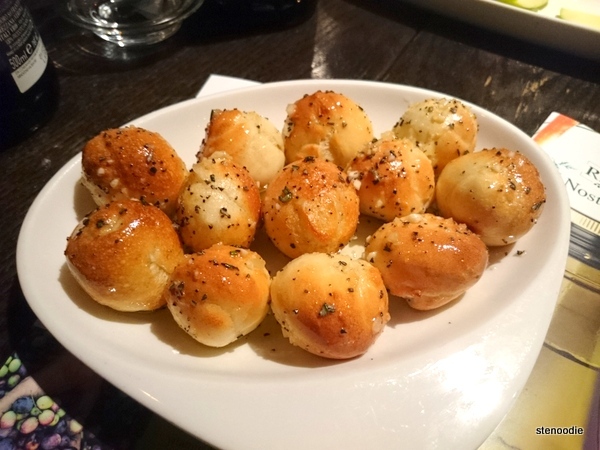 The Nodini were warm bread knots with olive oil, rosemary, garlic, and sea salt. 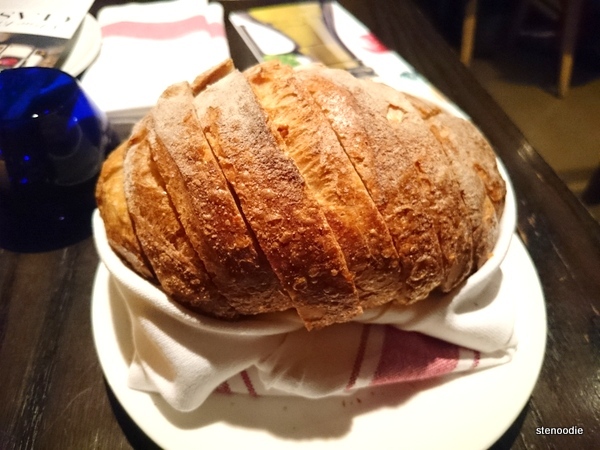 This looked so cute with all the bread knots sitting on the plate. The garlic and sea salt were a good touch to the bread knots. 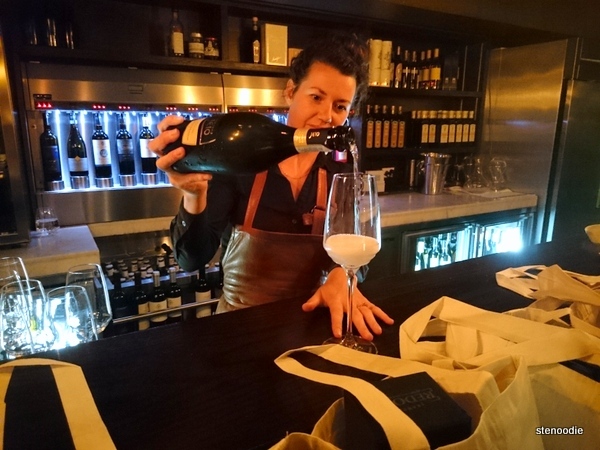 We tried the Prosecco, an Italian sparkling wine, to go with the hors d’oeuvres. 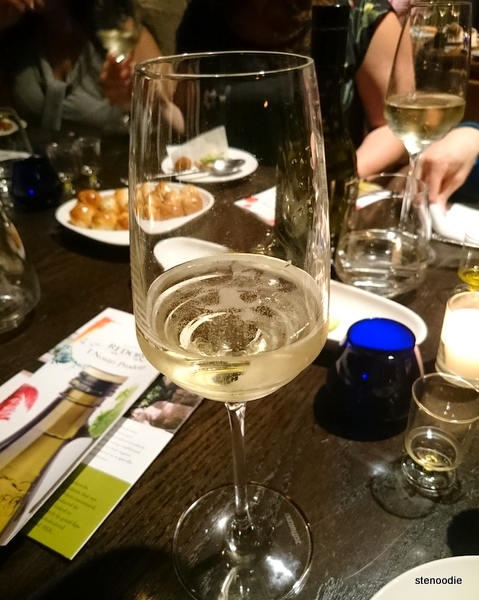 It was bubbly and not strong tasting at all. It was really nice that they were very generous with the hors d’oeuvres. The servers kept coming out with more and more platters of each type of hors d’oeuvres more than once. We quickly got full from all the food! We were able to chat with Elizabeth, the brand manager, for a bit and I found out that she flew in for the event from Connecticut just for the day! Hopefully they have more events in Toronto in the future; I really enjoyed the event. It was very well organized. 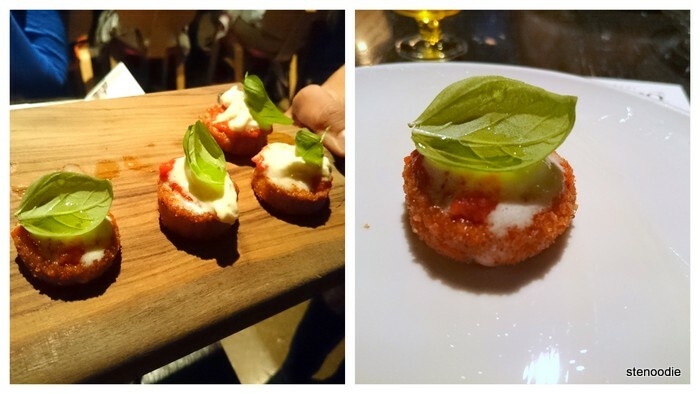 Last but not least, we were surprised with a dessert also inspired with the extra virgin olive oil ingredient! 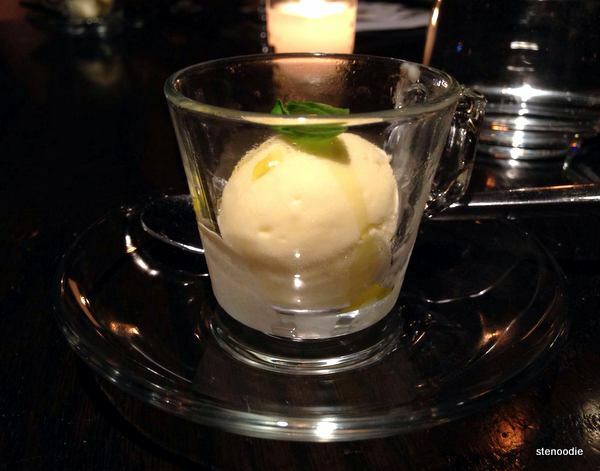 It was an Olive Oil Gelato in a little glass cup. 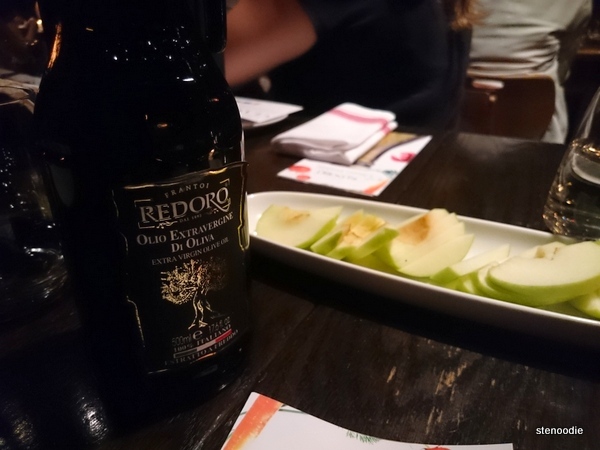 It tasted incredibly smooth and definitely like ‘olive oil’. Its ultra smooth texture also reminded me of how avocado gelato tastes. It was such a unique gelato since I have never had olive oil as a flavour before. It was really good! Before we left for the night around 8 p.m. (the event ended quite early before its suggested time of 9 p.m.), we got a gift bag. After I got home, I was so impressed with the contents of the bag! Flavor Your Life really went all out to help us know more about their brand and so that we can help them spread the word about the many uses and benefits of extra virgin olive oil! 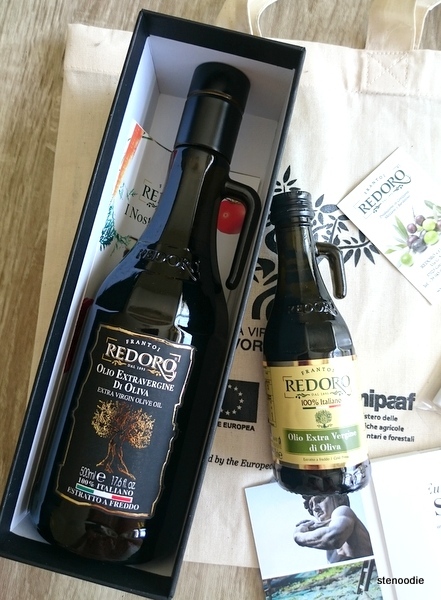 The Redoro Extra Virgin Olive Oil is bottled like a fancy wine! 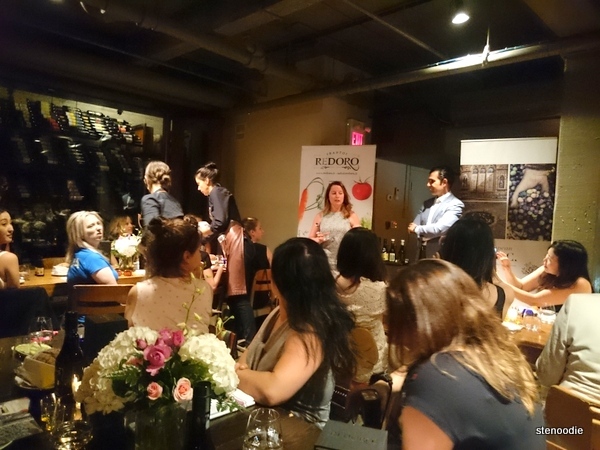 FTC Disclaimer: Although Flavor Your Life invited me to a complimentary tasting to showcase the Redoro Extra Virgin Olive Oil products, the opinions expressed here represent my own and not those of the companies. 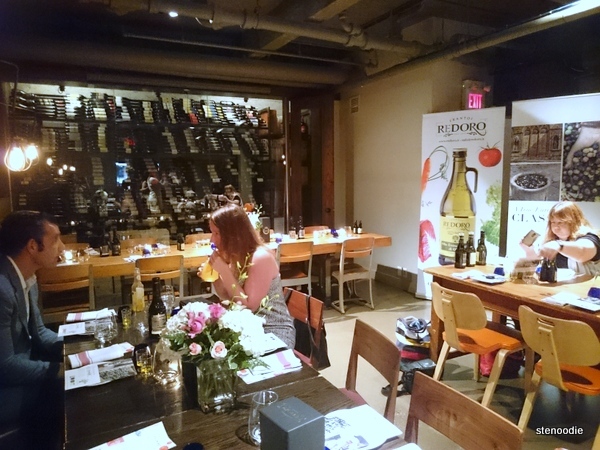 This entry was posted in Complimentary Adventures, Food and tagged 2016 EVOO Event Series featuring Redoro, 604 King Street W, @flavor_your_life twitter, @Redoro_VR twitter, Angelo Tramonti, benefits of extra virgin olive oil, blogger event at Buca restaurant, blogger events, Burrata Pizza, Extra Virgin Olive Oil Event Series, Flavor Your Life, fried olives stuffed with sausage, High quality Italian extra virgin olive oil, Nodini warm bread knots, Olive Ascolanes, Olive Oil Gelato, olive oil tasting event in Toronto, Orata raw sea bream, Prosecco Italian sparkling wine, Redoro, Redoro extra virgin olive oil, Redoro Frantoi Veneti, Redoro in Toronto. Bookmark the permalink.